Gin seems to be the hottest thing in town right now. Mixologists are exploring it with more depth, it’s popping as a star player in cocktail menus and new brands are coming to play. So it was inevitable that a gin-focused bar would open up sooner or later, and it makes sense that Tastings Group would be the ones paving the way for this gin-volution. 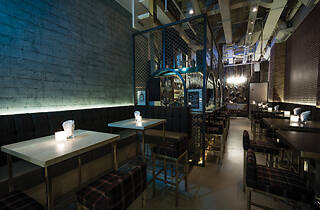 After all, Origin is the fourth venture in a series of drinks-themed watering holes from the Hong Kong beverage group. First came Tastings Wine Bar, then Angel’s Share, specialising in whisky, Quinary, serving mixology cocktails, and now, Origin. 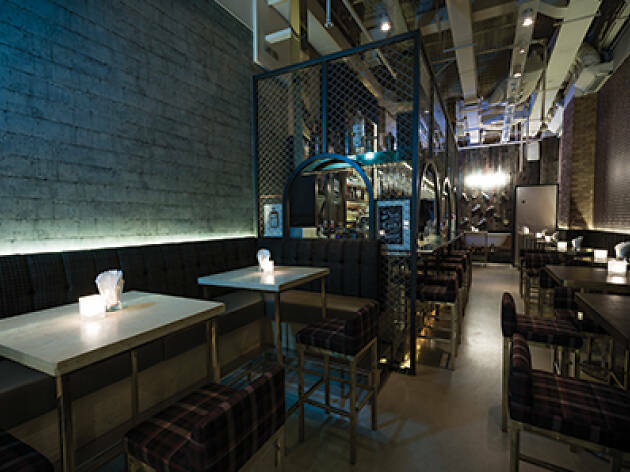 However, of all their projects, Origin is perhaps the most ambitious – partly because Hong Kong’s taste for gin is not as developed as it is for the other spirits. So as we step foot into this charming new watering hole, with retro, exposed brick walls and plush plaid seats, we have our expectations set. With a selection of seven classic and 11 signature cocktails, there’s a lot to be tried and tested for the evening. We start with the wonderfully named Aviation Extra ($130), a pale blue concoction with a smooth, full and round flavour and a dash of refreshing texture. Its blue colour is actually thanks to crème de violette which, alongside sour notes from lemon juice and bitters, comes full circle on the palate with maraschino liqueur and gin. This bittersweet melody remains fresh while sumptuous, and brings added delight with a criminally delectable maraschino cherry hidden at the bottom of the glass. Blue drinks are hardly ever any good so this is the first of many delights we discover during our time in the bar. The secret behind Origin’s fabulous creations is the same as Quinary: mixology. Using the same impressive gadgetry and techniques, Origin prepares its infused gins in-house before blending them into its drinks. This ability to capture the essence of almost anything (from cucumber to chocolate) makes mixology a thing of limitless invention and many of head mixologist Antonio Lai’s creations draw inspiration from everyday food. Among the more fascinating combinations is a smooth and penetrating Green Hornet ($110), made using pandan leaf-infused gin, the bright Basil Smash ($120), with basil-infused gin and bitters, and finally (a remix of Quinary’s most popular drink) the Classic Earl Grey Martini ($120), with lemon juice, egg white, Cointreau and slow-cooked Earl Grey gin so potent, it’s almost a stew. An absolutely delicious stew, may we add. We also enjoy the champAgnesed French 75 ($160), from the classics side of the menu but it is the originality and spirit of Origin’s signature recipes which impress the most and guarantee a return visit from us. Though the décor could benefit from darker flooring to ramp up the mystery and intrigue, most interior elements, including metal grills and a quirky bathtub sink in the toilets, work well, giving the bar an exclusive-yet-homely atmosphere – a perfect environment for its cosmopolitan clientele. G/F, 48 Wyndham St, Central, 2668 5583; originbar.hk.